I’m just back from teaching a writing retreat where 20 women worked so hard and so bravely to calm their minds and open their hearts and bring their voices forth. It is stunning what we are capable of when we give space, time and permission to our desires. We stopped focusing on word count (do I have enough to say? ), we made hard choices between projects, we wrote about anger, we realized our skills from a lifetime of writing could and would transfer to our new genre. We worked with and past the fears that keep us silent. And let me say: fear of speaking up, of using your voice, it makes sense! We all live in a world where having a voice as women can get us shamed, hurt, or even killed. Sometimes it doesn’t feel worth the risk. I feel that way sometimes. And I can’t help but wonder: if not now, when? Research shows personal changes can make a huge cultural difference because they influence others around us to change, too. The reduction in drunk driving and smoking are often cited as examples of this but research is also showing our personal choices around climate change can also be part of the solution. But here’s the rub: these personal changes? They can’t be easy. Replacing your light bulbs with more energy efficient ones? Good but too easy to affect others around you. What you do has to be harder than that, like flying less, eating no meat, having fewer children, putting solar panels on your home, going on vacation locally. When your neighbors and friends see you making these kinds of changes, they are directly influenced to make changes too! Which brings me back to sharing your voice. When you speak up, you influence others. Especially if it’s hard for you! And in doing so? You can change our poor hurting world for the better. I would love to do exactly that for you this Saturday, November 10th at my very first all-day virtual writing retreat. It’s for writers of all kinds, all genres. For beginning a project or restarting a project or needing a kickstart to finish. Or if you are doing NaNoWriMo, get a lot of words written! There will be writing prompts that will light you on fire and help you write with intention, we will keep our Zoom room all day so you are always writing with others (less lonely! ), there will be a chance to read to each other (no criticism allowed!) and time for Q&A! 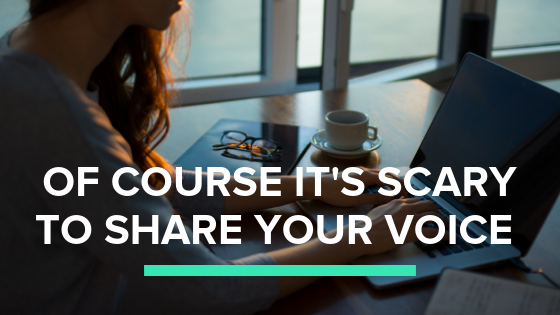 Instead of silencing our voices, let’s ask how can we make it safer to share our words? How can we support each other? How can we champion each other in our call for truth, for beauty, for love, so that those calls can ripple forth? One possibility is to gather together with my help and your writing sisters, to see where and how fear is stopping you, to calm your minds and fortify your heart, and spill a lot of words on the page.